We would like to highlight the Outstanding Reviewers for Physical Chemistry Chemical Physics in 2016, as selected by the editorial team, for their significant contribution to the journal. The reviewers have been chosen based on the number, timeliness and quality of the reports completed over the last 12 months. We would also like to thank the Physical Chemistry Chemical Physics board and the Physical Chemistry community for their continued support of the journal, as authors, reviewers and readers. PCCP are happy to anounce some new advisory board members starting in 2017. Check out our PCCP page for more details on our Editorial and Advisory board members. We are delighted to welcome Professor Piero Baglioni as our newest Associate Editor for PCCP. 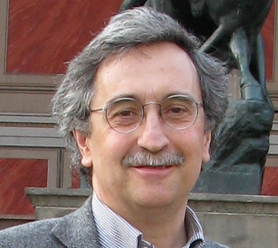 Professor Piero Baglioni is a professor of Physical Chemisty at the University of Florence and director of the Italian Center for Colloid and Nanoscence (CSGI). His scientific interests focus on the Physical Chemistry of soft matter systems, both from a fundamental and an applicative point of view. In particular his research interests concern amphiphilic and lipid self-assembly, water confinement in inorganic and organic matrices, and the design of inorganic and hybrid nanostructured materials for applications in different areas, as materials for cultural heritage conservation, coatings, building materials. Welcome Professor Piero Baglioni and his Editorial Office can be selected on submission to PCCP here. PCCP are pleased to anounce that the Insights from advanced methods in molecular dynamics themed issue is now online. This issue aims to highlight the new insights and applications that have been enabled by the use of advanced molecular dynamics techniques and potentials. The issue is guest-edited by G. Andres Cisneros (Wayne State University), Haiyan Liu (University of Science & Technology of China), Jean-Philip Piquemal (Sorbonne Université) and Pengyu Ren (University of Texas at Austin). Click through to read the Themed Collection online Developments in Density Functional Theory, guest edited by Robert van Leeuwen, Johannes Neugebauer, Lucas Visscher and F. Matthias Bickelhaupt. Read the Editorial for an overview of the collection. How molecular is the chemisorptive bond? We held the 7th UK-Japan Symposium at Burlington House, bringing together 115 scientists from over 40 institutions to discuss fundamental research advances in carbon nanomaterials. These materials have many exciting potential uses, from more efficient energy storage to better drug delivery, but we can only develop these applications if we understand their chemical properties. As well as more established experts, delegates heard from some rising stars, and over forty early career researchers presented their work during an extended poster session. We held the event in partnership with the Chemical Society of Japan (CSJ). For the first time, we also received support from the Japan Society for the Promotion of Science, allowing us to attract an even wider audience of researchers. It was followed a reception hosted by the Embassy of Japan to celebrate our close and long-standing partnership with the CSJ, and the even longer history of chemical collaboration between our two countries. “It is our hope that the symposium will provide a springboard for tomorrow’s activities in this field and contribute to strengthen our friendship. We look forward to continuing our close partnership between CSJ and RSC reflecting our deep and long history.”, said Professor Maruyama on behalf of the Chemical Society of Japan. Click through to read the Themed Collection online Neutron Scattering in Catalysis and Energy Materials, guest edited by Richard Catlow (University College London), Stewart Parker and Ian Silverwood (ISIS Neutron and Muon Facility, STFC). Read the Editorial for an overview of the collection.